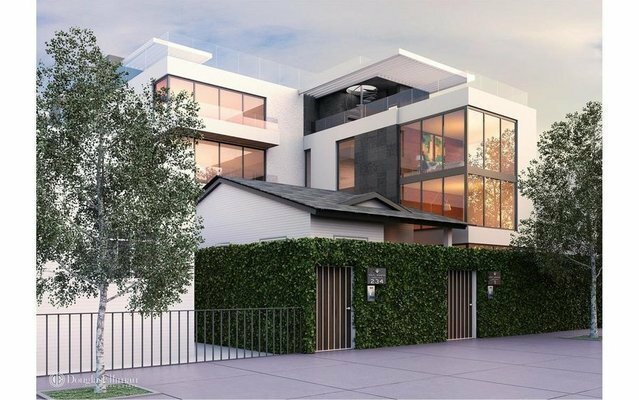 New luxury townhome 2 blocks from the Beach in "South of Fifth". Resident A is an adaptive reuse of a historic bungalow with new construction with three levels of living area plus a rooftop deck overlooking the treelined street. Enter from the front through a private entry gate and front porch or from the back next to the owners two side-by-side parking spaces. Private Elevator, white oak flooring, Poggenpohl cabinetry, Wolf gas stove, Subzero Refrigerator, Miele expresso machine. The first level has an open floor plan with formal dining room & living room. Bathrooms have floor to ceiling Italian marble, Waterworks hardware, Ornare cabinetry. The large rooftop terrace with large jacuzzi, IPE wood decking, built-in planters, lighting and irrigation system. Low HOA fees.